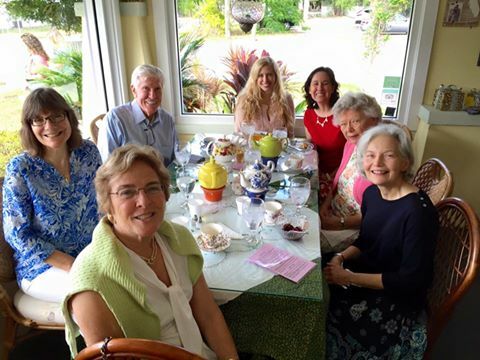 The Southwest Florida JASNA group held their second annual Jane Austen Birthday Tea at the Wisteria Tea Room on Saturday, December 17th. The group enjoyed a lively discussion about a variety of topics, and the Wisteria Tea Room delighted the attendees by singing “Happy Birthday” in honor of Austen. Pictured (from clockwise from the end of the table: Anja Carlson, Sara Dustin, Bonnie Lincoln, Betty Zausner, Maddie Stewart, Lisa Geelhood, and Sam Stewart.